Looking for an exciting new way to enjoy those protein-packed eggs? Try Eggs Italian! This recipe is an ultra-frugal THM S meal that requires no special ingredients, can easily be adapted to large family or single serve needs, and takes just a few minutes to prepare! 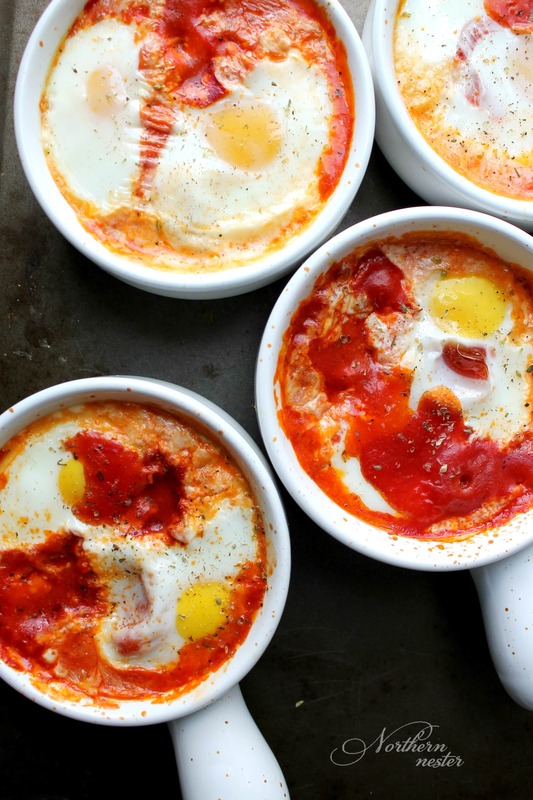 All you need to make these individualized brunches or dinners are eggs (2 per person), a little olive oil or butter, a bit of freshly minced garlic and some finely chopped onion, a can of crushed tomatoes, sea salt, ground pepper, dried oregano, a splash of cream, and a few small chunks of mozzarella cheese. 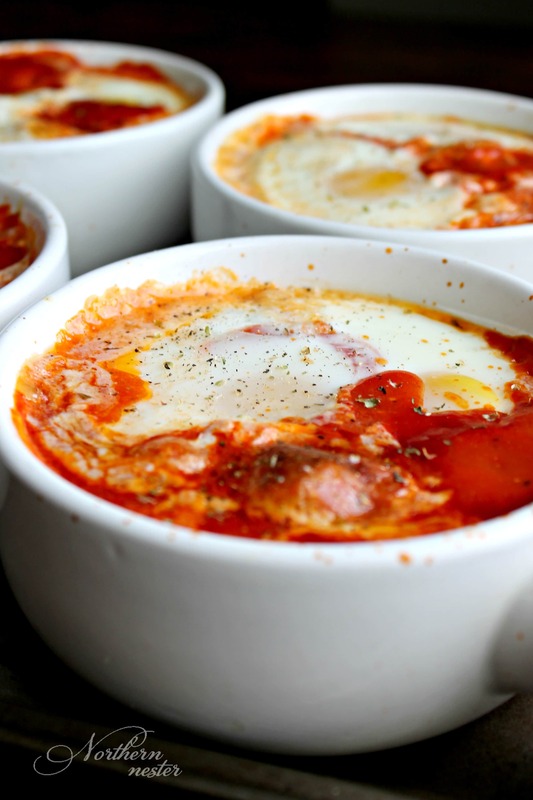 I like to bake my Eggs Italian in ramekins or oven-safe soup bowls, but you could also use a 9×13″ baking pan and bake the whole recipe in there. Preheat oven to 350 F. Set 6 ramekins or bowls on a baking sheet. In a saucepan, saute onion in olive oil until clear. Add garlic and cook for another minute. Pour in crushed tomatoes and spices. Stir and heat through. Divide sauce between soup bowls (approx. 1/4 cup in each bowl). Pour 1 tbsp of heavy cream in each bowl, and divide cheese evenly among each dish. Top each serving with two eggs. Bake at 350 for 25-30 minutes, depending on how runny you like your yolk. Serve immediately. This meal can easily be turned into a crossover by serving with a crusty slice of spouted or sourdough bread. you had me at eggs & tomatoes. yum! pinned it 🙂 i love that you can make them individually as my husband will not eat eggs like this (weirdo). I will have to try this…it sounds very tasty! Did you have a certain size of can of tomatoes? I used a 28 oz can when I made it and that seemed right.